Our most important service is our dedication to you, our customer. We are always ready to answer all of your landscape design question and provide helpful suggestions and ideas. Our goal is to make sure each and every customer understands what a natural stone Feature can do to enhance their out door entertainment area and provide them with the knowledge of how to do it. We also offer our "Piggy Back" delivery system which allows us to deliver your product to the work site and not just the curb. Call us today to discuss your design ideas and we will help make your dreams a reality. Lones stone is your one-stop shop to create your dream outdoor living space. From mulch and rock for your flower beds to fully functioning fireplaces and beautiful landscapes complete with a water feature, we can help you design and build an outdoor area that you can use and enjoy year round. If you are looking for any type of natural stone product for your project Lones Stone is sure to have what you are looking for. We have a large selection of stones that can be decoratively placed on your property. If you are interested in building a retaining wall or simply using aggregate make sure to check out our inventory. If we do not have the exact color or size you are in need of we are happy to place special orders with our suppliers. 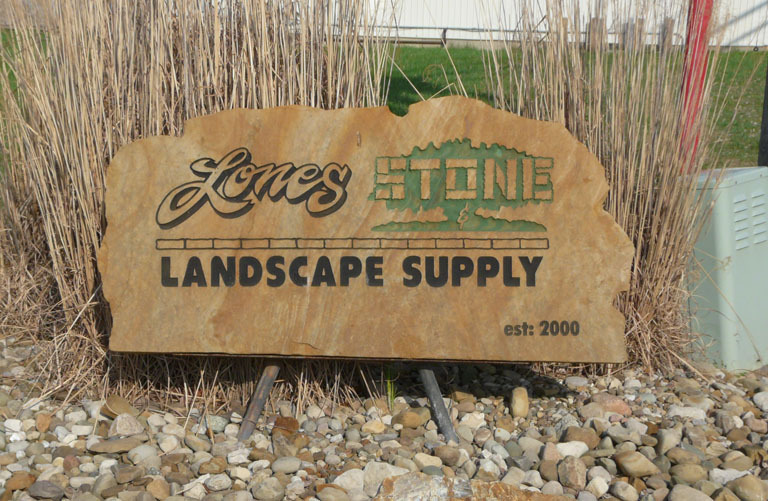 Lones Stone even offers more decorative pieces for your enjoyment. We have a variety of sculpted pieces available as well as laser etched items. Decorative animals or personalized pieces, unique to your interest, can be placed around your home to add and interesting design element. Lones Stone is the perfect choice for your engraving needs. For personal use, we can do your house number or your last name on a stone to welcome people to your house. If your business is in need of your logo placed on something small like a business card holder or something larger like a large stone placed at the entrance of your office location. We also offer a fundraising program with engraved bricks. A great way to leave a permanent wall or walkway while allowing people to leave their personal messages and names as donors to your organization. Lones Stone can help set you apart from your neighbors or business competitors with one of our one-of-a-kind engraved stones.